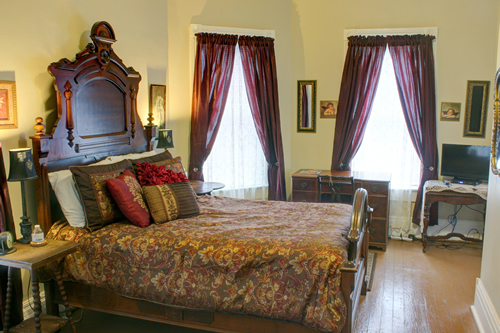 Room 1 Grand Victorian Inn has a Victorian full size bed, cozy room, private bath, cable, WIFI, and full breakfast 8:30 am. Overlooks front and wedding gardens from 4 windows. DEPOSIT REQUIRED – First night stay to confirm the reservation, non-refundable. CANCELLATION POLICY – If booked on a special rate, the entire stay is non-refundable. Fee $50 for canceled reservations. First night is non-refundable. We have strict policies due to so few rooms and so many guests wanting to book with us. We cannot guarantee the room you booked but will make every effort to give you the room you desired.